This article was originally published in The Algemeiner under the title "BDS Is Contemptible, But Academic Boycotts Have Their Place". Academic boycotts, rightly understood and employed, are an effective means of isolating and stigmatizing universities and other institutions that support authoritarian regimes (like Erdogan's Turkey) or provide a platform for spreading pro-terrorist propaganda (as at An-Najah or Birzeit universities in the West Bank). By refusing to acknowledge the legitimacy of universities controlled by regimes that deny basic academic (and human) freedoms, boycotters undermine corrupt systems and lend moral support to academics fighting for their rights and even their lives. Contrary to the claims of BDS advocates, Israel is a free, democratic state with equal representation for all citizens, regardless of their religious or ethnic background. Israeli universities, far from suffering under state or party control, are home to some of Israel's harshest critics, who are free to condemn or praise governments and religious leaders or even question the legitimacy of Israel's existence. They are anything but tools of the state whose livelihood and freedom depend on praising the government or censoring their opinions. In light of these widely known facts, BDS proponents reveal their antisemitic motivations in a myriad of ways, most obviously in singling out Israel — the world's only Jewish state — for condemnation, while turning a blind eye to genuine human rights abusers such as Iran, Saudi Arabia, North Korea, Cuba, and China. The BDSers' false assertions regarding Israeli history — from denying the long and vibrant history of the ancient Hebrews, to claiming that Israelis are European "settler colonialists" comparable to Nazis — also expose their antisemitism. These abuses do not, however, invalidate academic boycotts per se. Blanket opposition to boycotts willfully ignores the intellectual and moral corruption of academic institutions in countries controlled by authoritarian regimes. This refusal rests on a moral relativism that treats all regimes and their academic systems equally, regardless of the legitimacy of a nation's academic enterprise. Far from mounting a brave defense of academic freedom, university presidents and others opposed to all academic boycotts shun their responsibility to make difficult and potentially unpopular decisions on a case-by-case basis. Unfortunately, ours is not the first era in which America's academic leaders have chosen expediency over justice, and hidden behind the cry of "academic freedom." In their shameful failure to condemn the Nazification of German higher education systems following Hitler's rise to power in 1933, America's academic elite — led by Nicholas Murray Butler and James Bryant Conant, presidents of Columbia and Harvard, respectively — cloaked their antisemitism with high-minded defenses of academic freedom that would ring familiar today. Despite the odious "cleansing process" that legalized firing Jews and political opponents in German academe, plus daily press reports of the persecution of Jews throughout Germany, Butler, Conant, and many others maintained ties with their German counterparts, welcomed Nazi officials to their campuses, sponsored academic exchanges with German universities, and actively suppressed student and faculty demands for boycotts against Germany's once-great academic institutions. An analogous situation exists today in Turkey, where an Islamist-inspired "cleansing" of academia has occurred since the July 2016 coup attempt. President Recep Tayyip Erdogan's regime has fired over 5,000 academics and more than 33,000 teachers, while jailing thousands more. Many were charged with having connections to the Gülen movement, part of a network associated with exiled spiritual leader and former Erdogan ally Fethullah Gülen. As a result, government-backed Islamists control Turkey's universities, where any remaining secularists or moderates must keep a low profile on pain of termination or imprisonment. Yet many American professors of Middle East studies are mimicking Depression-era academics in their refusal to acknowledge a tyrant's persecution of their colleagues. Last October, specialists from elite universities, including Columbia, Georgetown, UNC-Chapel Hill, and UC-Berkeley, gathered for the Second International Conference on the Muslim Ummah at Istanbul Sabahattin Zaim University. That the conference chair was Sami Al-Arian, who pled guilty to aiding Palestinian Islamic Jihad, a State Department-designated terrorist organization, while teaching at the University of South Florida (and who was subsequently expelled to Turkey and now teaches at Sabahattin Zaim), bothered no one. Nor were Americans and other Westerners deterred from participating in an earlier Istanbul conference sponsored by the Al Sharq Forum, a defender of Islamism, the Muslim Brotherhood, and Turkey's rulers. In October 2016, scholars from Harvard, Michigan, and UNC-Chapel Hill gathered to hear regime-approved lectures from, among others, Erdogan's chief spokesman Ibrahim Kalin, who earned his Ph.D. in Islamic studies from George Washington University, and is a senior fellow at Georgetown University. Participants in both conferences didn't travel to Istanbul to speak truth to power by critiquing Erdogan's brutality and challenging the legitimacy of his actions. Rather, they ignored their host's ongoing destruction of academic freedom and, at the 2018 conference, harshly critiqued Israel, America, and the West. Their presence lent a veneer of legitimacy to Turkey's violations of academic rights while ignoring the plight of their colleagues languishing in prison or suffering from unemployment and internal exile. Excusing the inexcusable was also the goal of a memorandum of understanding (MOU) signed by San Francisco State University (SFSU) and An-Najah University in the West Bank. Facilitating a series of trips by perennial anti-Israel activist Rabab Abdulhadi, the director of SFSU's Arab and Muslim Ethnicities and Diasporas Initiative, the MOU exists in spite of An-Najah's undeniable ties to Hamas operatives and terrorists. SFSU has also pursued agreements with Bir Zeit University, another West Bank school teeming with Hamas supporters. Such institutional arrangements with American universities serve to normalize the radical, antisemitic, pro-terrorist atmospheres at these schools. America's university leaders can avoid the errors of their 1930s predecessors by first confronting the morality (or immorality) of any individual boycott effort, including the lies and hatred that drive BDS, and second by severing ties to institutions that have ceased to exist (if they ever did) as independent centers of higher learning. Dissident academics suffering mass persecution — not the lackeys now running academe in Turkey — deserve the backing of their American colleagues. In the West Bank, universities honeycombed with terrorist supporters should be called out for their systemic corruption and cultivation of bigotry. 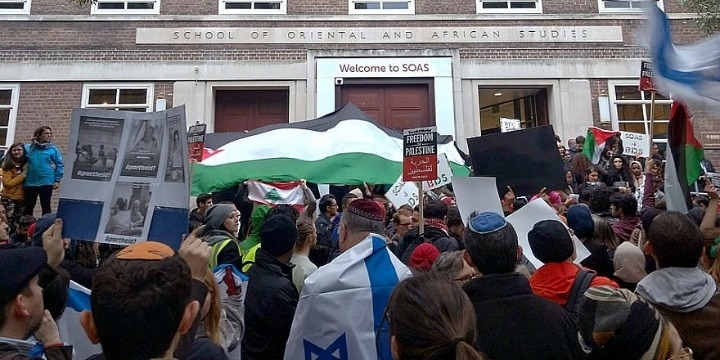 By refusing to give their moral and intellectual support, American academics can strike a blow against vicious regimes and the academic establishments that support them, while exposing BDS supporters' dark motives.